Stick a fork in it...it's fun! "The Bender You Say" is the thirteenth comic issue, which was released 28 May, 2003 in the US and 13 January, 2005 in the UK. After his cooking puts the planet express crew to sleep, Bender searches for a way to spice it up from a black market. The store owner gives him what Bender thinks is pepper, which is now sent directly to the ministry of defence as it killed a species of invading aliens, making the pepper illegal contraband. Bender is then fired after his food kills the health inspector (due to "S/P" actually standing for smallpox) and the only job he can hold is cooking for the Robot Devil, who is then also killed by his cooking. This causes robots to stop coming to the Temple of Robotology, and in the last moment of need, the Preacherbot turns to Bender to be the new Robot Devil. 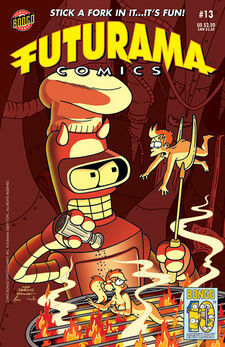 With Leela and Fry as his minions, Bender ends up turning robot hell into a paradise for sinners. Fry then has to remind Bender that he has to torture the robots. Bender finds that being the devil is too hard work and runs off to work in a soup kitchen. Fry and Leela follow him and they all find the Robot Devil had faked his death to get a vacation on the Sun. While they were gone all the sinners escaped, so the devil uses a sin magnet to bring them back to hell. Bender is then revealed to be the reincarnation of the robot Buddha. This was the first issue to be split in half in the UK. An eight-page extract of this comic was reprinted in Bongo Comics Gimme Gimme Giveaway! for free comic book day 2005. The Temple of Robotology's sign reads "Church of Robotology". The pigtailed, red haired girl and blonde boy orphans are miss coloured.